Denton House is situated in the village of Hesket Newmarket - a traditional fell village situated in the Northern Fells of the English Lake District. We're perfectly located for an enjoyable and relaxing stay in the Lake District National Park and there are some superb walks to be had in the area. All of the hills at the back of Skiddaw and Blencathra are within easy reach and there are many more gentle walks to be had around the local area. Hesket Newmarket has a village shop & post office. The award winning village pub, The Old Crown, was Britain's first co-operatively owned pub - by the villagers themselves - and is 20 yards up the road. The famous micro brewery, the Hesket Newmarket Brewery, is located behind the pub and make it a popular place for real ale enthusiasts. The pub usually has at least 5 real ales on at any one time which are usually CAMRA award winners. The pub also serves excellent home-cooked bar meals. Hesket Newmarket also holds an agricultural show in September every year which features wrestling, horses, ponies, hounds and terriers. The picturesque village of Caldbeck is only a mile away. The village still reflects its former industrial heritage with many of the old mill buildings still in use today. 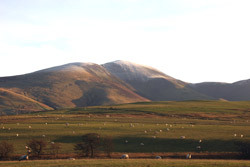 The Caldbeck Fells in former times were riddled with mines, long since disused. 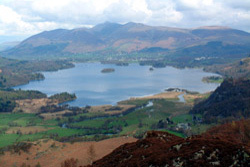 Fell walking, mountain biking, cycling and horse riding are all popular pastimes in this part of the North Lakes. Forget your car! Just step out the door and on to the fells. The Cumbria Way also passes close to the village as well as the long distance cycle route, namely the Reivers Route. Other local places to eat include the Watermill Cafe and Oddfellows Arms in Caldbeck, the Snooty Fox in Uldale and the Mill Inn in Mungrisdale. The bustling market town of Keswick between Derwentwater and Bassenthwaite Lake, overlooked by 3053ft Skiddaw, with its outdoor equipment shops, restaurants and café's is only a short drive away. The historic border city of Carlisle with its medieval castle, cathedral and Tullie House Museum is also approximately 15 miles away.